In this tutorial I’ll use the Microsoft Face API to create a face recognition app with React Native. I’m going to assume that you’ve already built a React Native app so won’t cover all parts of the code. If you’re new to React Native, I recommend you read my previous tutorial on “Build an Android App with React Native“. You can find the full source code for the app for this tutorial on Github. 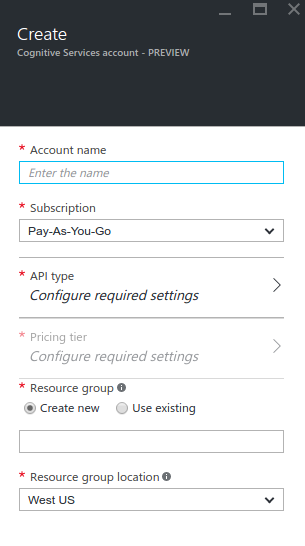 The first step is to acquire an API key from Microsoft Azure. If you’re not aware of Microsoft Azure, it’s Microsoft’s Cloud Computing Platform. Sign up for a Microsoft Live account if you don’t already have one. For those of you new to Azure, sign up for a free trial. This will give you 30 days to use Azure for free, provided you don’t exceed the allotted HTTP requests for the free tier of the Face API. If you’ve already created an account before, you can use your existing subscription plan. If you don’t have one, select the Pay-As-You-Go plan so you get charged for only what you use. Fill out the required fields. You can enter any name that you want for the account name, and subscription should be ‘free trial’ if you’re a new user and ‘pay-as-you-go’ if you’re an existing one. Resource group can be any name you want. Resource group location should be a server near your current location but you can stick with the default if you want. For the API Type select ‘Face API’ then ‘free’ for the pricing tier. This will ensure you don’t spend anything. Once you’re done filling everything out, click on the create button and wait for the resource to finish deploying. Click on keys to view the API keys. Take note of one of these keys as you will use them later when making a request to the API. Create a face list: A face list is a container for faces. Think of it as a database for a group of related faces. Add faces to the face list: The face list is a container, you need to add photos which contain a single face. These will be used for comparison later. Get similar face: Used for getting a similar face from the face list based on a face detected on a photo. The flow is to first create a face list, add photos of faces to it, and then get a list of similar faces based on a photo provided. This will install React Native version 0.25.1 and React version 0.14.8. Run npm install to install the modules just added. You use the react-native-button dependency for creating buttons, react-native-image-picker for picking images from the users photo gallery (or the device camera) and react-native-fetch-blob for sending the blob of the picked image to the API. Once installed, while you’re still on the root directory of the project, run rnpm link to automatically configure the project to add the necessary android permissions and link the files for the third-party modules to work. Breaking down the code above. First you import the SimilarFaces component, where you find most of the app logic. Declare the options that the image picker will use. These are mostly clear so I’m not going to explain them here. You can visit the Github repo of this component to see what other options you can supply. Inside the main app component, use the SimilarFaces component which you will create shortly. Pass in the image picker options and the API key as properties so you can access them inside the component. Include the custom library for making HTTP requests to the Face API. You’ll be creating this in the Requestor section later. Declare the data used when creating a face list, adding faces to face list and getting a similar face. The facelist_id is the unique ID for the face list and facelist_data is the descriptive name that you want to give to the face list. You can change the values for these if you want. The render method returns the UI of the app. This contains the button for creating a face list, displays the photo selected by the user, the button for selecting photos, a text input for entering the name of the person added, the button for getting a similar face, the photo of a similar face and a custom message. The _changeName function updates the state of the new value of the text field for entering a person’s name. The _pickImage function allows the user to pick an image either from the camera or the gallery. This uses the react-native-image-picker library. Once you receive a response, update the style of the image container with the dimensions of the image picked. Also set the file path and the base64 representation of the image into the state. This way you can use it later when adding faces to the face list or when getting the similar face. Next is the _createFaceList function which sends a request for creating a new face list to the Face API. The facelist_data is the hard-coded object which you declared near the top of the file earlier. The _addFaceToFaceList function adds face data to a face list, this time using the upload function from the Requestor library. This accepts the URL where you want to send the request as its first argument, the API Key as its second, the base64 representation of the selected photo as the third, and the user data as the fourth. The value for userData is converted to a string because the upload function sends it as a query parameter. That’s also why you’re limited to sending minimal data with a maximum length of 1KB. The _getSimilarFace function first sends a request to the face detect endpoint. This assigns a unique ID to the faces detected in the photo and returns them along with the width, height, top, and left position for constructing a box surrounding the detected face. But for this tutorial you’re only using the face ID. Once you receive a response, extract the faceId from the first row of data. The code below assumes that the photo has a single face in it, that’s why it only extracts the first row. Next, construct the object containing the data that’s required by the find similar faces endpoint. This includes the face_id received from the face detect call, the ID of the face list where the Face API is going to perform its search, and the maximum number of similar faces to return. In this case sticking with two. You specify 2 although you’re only going to display one similar face because specifying 1 would return the photo with the closest match. This means if you add me.jpg and me2.jpg to the face list, and then select me.jpg again for getting the similar faces, it will return me.jpg if you only specify 1 as the value for maxNumOfCandidatesReturned. If you specify 2 and then extract the second row from the results, you’ll get me2.jpg instead. This works vise-versa (supplying me2.jpg to the similar faces endpoint returns me.jpg). All this means is that you’re getting the second closest match so there is no chance that the API will ever return the same photo. Send the request to the find similar faces endpoint, converting the data constructed into string because it’s what’s expected by the Face API. Once you receive a response, extract the second row from the results returned. Then make a request to the endpoint for getting a specific face list. This contains all the face data added by the user. Loop through it to find the one with the same face ID as the one returned by the similar faces endpoint. Note: You need to parse the userData because it’s saved as string. You then use the data to update the state with the similar photo and the message containing the name of the similar face and the confidence number. The confidence number is between 0 and 1. Numbers closer to 1 means a higher possibility that the photo the user supplied is of the same person as the one returned by the API. Breaking down the code above. The upload function handles all the HTTP requests for uploading files to the Face API. This uses the react-native-fetch-blob library to send the base64 representation of the photo along with header information required by the Face API. Next is the request method which handles simple HTTP requests such as posting string data to a server. Launch the app. The first thing that you need to do is download photos of faces from the internet. Make sure that each photo contains one face and that each person should have at least two photos. Once you’ve downloaded photos, copy those into your device and then run the app. Tap on the create face list button. You should see an alert saying that the face list was created. Next, tap on the pick image button and pick one of the photos. Enter the name of the person and tap on the add face to face list button. You should see an alert saying that the face was added. Do this as many times as you want, but make sure that each person has at least two photos. Lastly, tap on the pick image button again and pick the photo you want to use for getting the similar face. Once picked, tap on the get similar face button. This should return one of the photos of that person that you’ve added earlier, but not the same photo you picked. Face Detection: It’s a prerequisite for getting a similar face that’s why I didn’t cover face detection features such as estimating the age of a person or guessing their gender. You can also determine facial features such as if a person is wearing glasses or not, or facial hair. Face Grouping: For grouping faces based on similarity. Face Verification: For performing authentication against two detected faces. You can use this as a form of authentication in your React Native apps. Instead of having the user type in their email and password, they can take a selfie to login. Face Identification: For identifying people from a detected face. Like the similar faces API, you have to add faces first before you can make use of it. Any other comments or question, please let me know below.